When you first see the Junk you will feel as though you've taken a trip back in time. 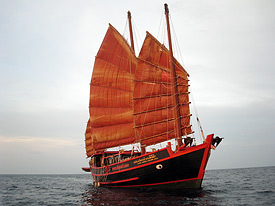 The â€œJune Hong Chian Leeâ€� is one of several junks built in Penang, Malaysia.Â She is a 30 meter, 140-ton, three mast junk, with 330 square meters of sails. Built in 1962 for charcoal transportation, the June Hong Chian Lee was part of a small merchant fleet that traded up and down the coastline from Burma to Malaysia. After mainly being used to transport mango wood charcoal until 1985, she was restored and redesigned to serve as a classic yacht. The Junk is constructed mainly from a hard teak wood called Takien Tong. Extremely strong, the wood is used for the three masts that rise 23 meters above the deck - 28 meters above sea level. The trees cut for these huge masts date back over 300 years. According to legend, the June Hong Chian Lee has a murky past with stories of pirate cargo hidden beneath the charcoal. Secret compartments were often built deep inside the bulkheads, and there are old tales of junks dropping anchor beside coastal caves rich with gold ore and of pirates blasting out their booty and hiding it on board. Take this chance to explore some of the best diving spots around Phuket from this exquisite boat. All 6 cabins have en-suite bathrooms and individually controlled air conditioning. The big salon doubles as a deluxe restaurant and is also the perfect place to prepare your photo or video equipment and to watch the days results on the TV. The Junk's immense deck area allows divers to suit up in comfort, relax between dives, watch the stars at night, or work on the ultimate suntan. The Junk has a well known reputation for the highest level of service. From November through April the Junk makes some excellent 5 day/6 night trips allowing ample time to explore the many dive sites of the Similan and Surin Islands. The Junk is one of the few Phuket liveaboard dive vessels that actually dives regularly in the area around the Surin Islands where the dive sites are less known and just ready to be explored.